Lesson Twelve Pekah & Hoshea 2 Kings 15:23 - 17:6; 2 Chronicles 28:5-15. 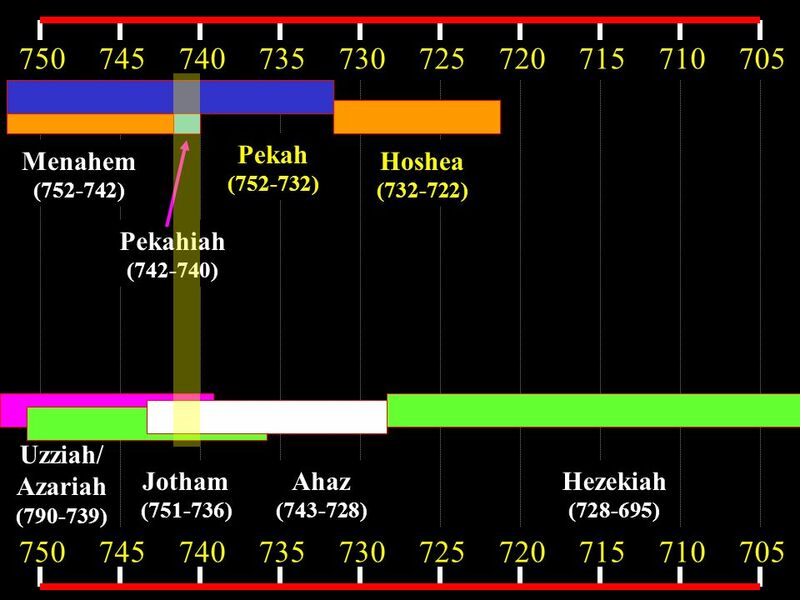 6 Pekah was the son of Remaliah and is described as an officer of Pekahiah, son of Menahem (2 Kings 15:25). 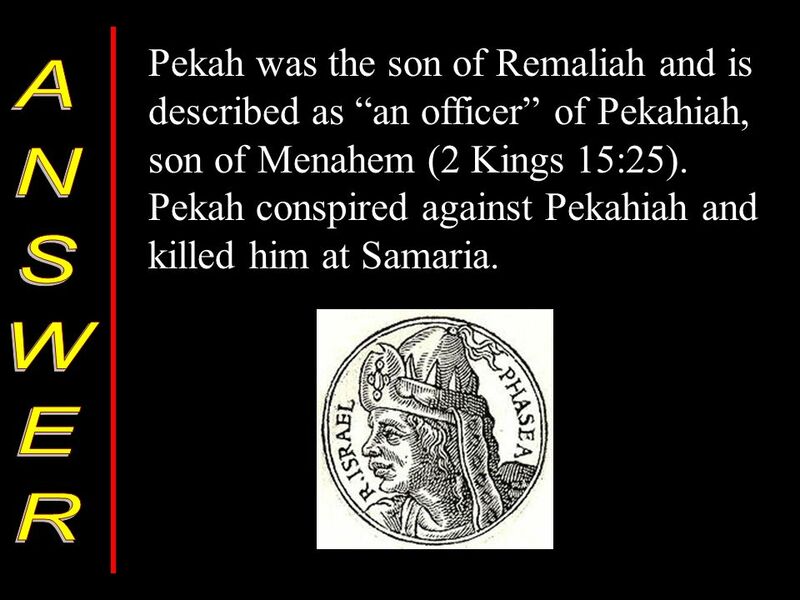 Pekah conspired against Pekahiah and killed him at Samaria. 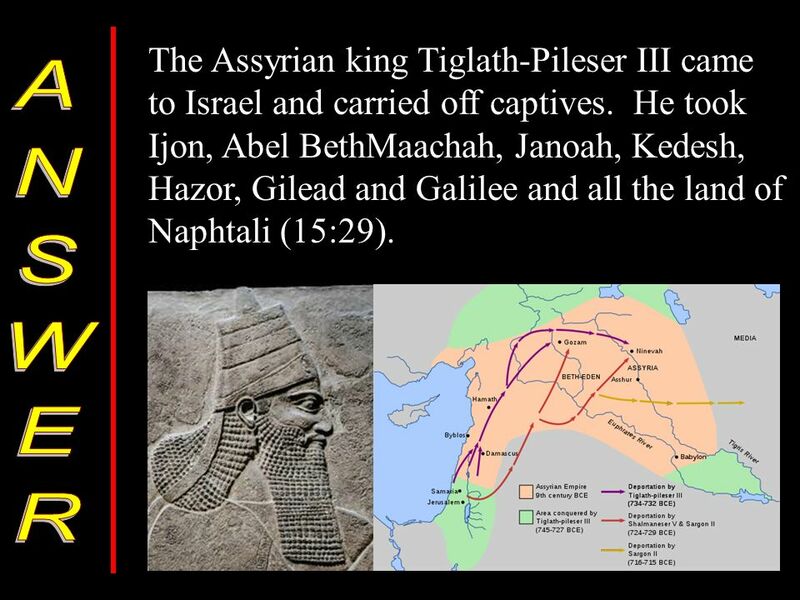 8 The Assyrian king Tiglath-Pileser III came to Israel and carried off captives. He took Ijon, Abel BethMaachah, Janoah, Kedesh, Hazor, Gilead and Galilee and all the land of Naphtali (15:29). 10 Pekah allied himself with Rezin, king of Syria (Aram) (2 Kings 16:5). 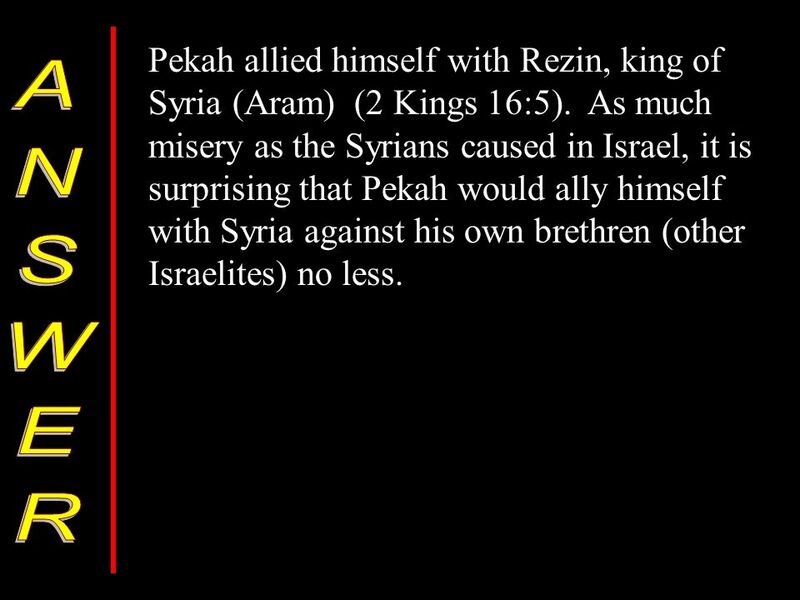 As much misery as the Syrians caused in Israel, it is surprising that Pekah would ally himself with Syria against his own brethren (other Israelites) no less. 12 Pekah and Rezin besieged Jerusalem, but were unable to overcome him (2 Kings 16:5). 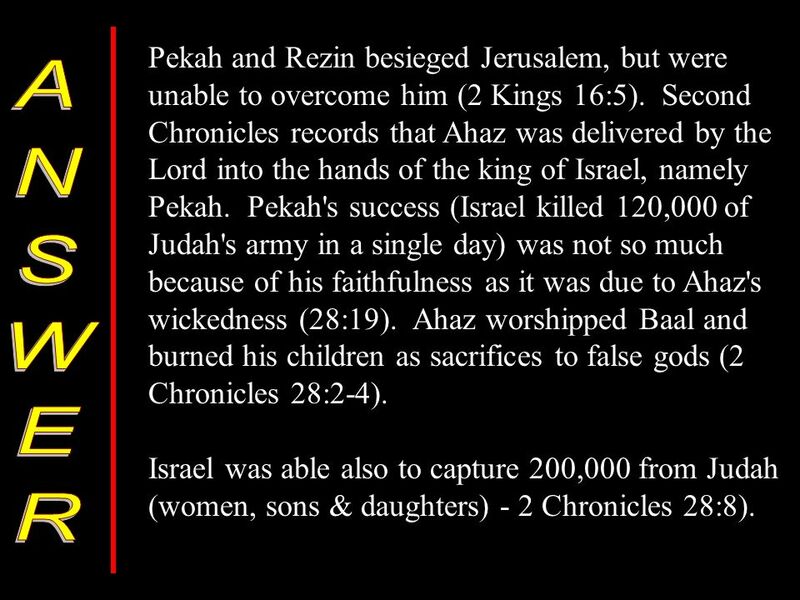 Second Chronicles records that Ahaz was delivered by the Lord into the hands of the king of Israel, namely Pekah. Pekah's success (Israel killed 120,000 of Judah's army in a single day) was not so much because of his faithfulness as it was due to Ahaz's wickedness (28:19). Ahaz worshipped Baal and burned his children as sacrifices to false gods (2 Chronicles 28:2-4). Israel was able also to capture 200,000 from Judah (women, sons & daughters) - 2 Chronicles 28:8). 14 He informed the army of Samaria that Judah had been delivered into their hand because of God's anger against Judah. Furthermore, he implicitly rebukes them for their violence against Judah (2 Chronicles 28:9-10). He counseled Israel to return the captives that they had taken (28:11). Interestingly, Israel did just that and treated the captives well, providing their needs out of the spoil which had been taken in battle. 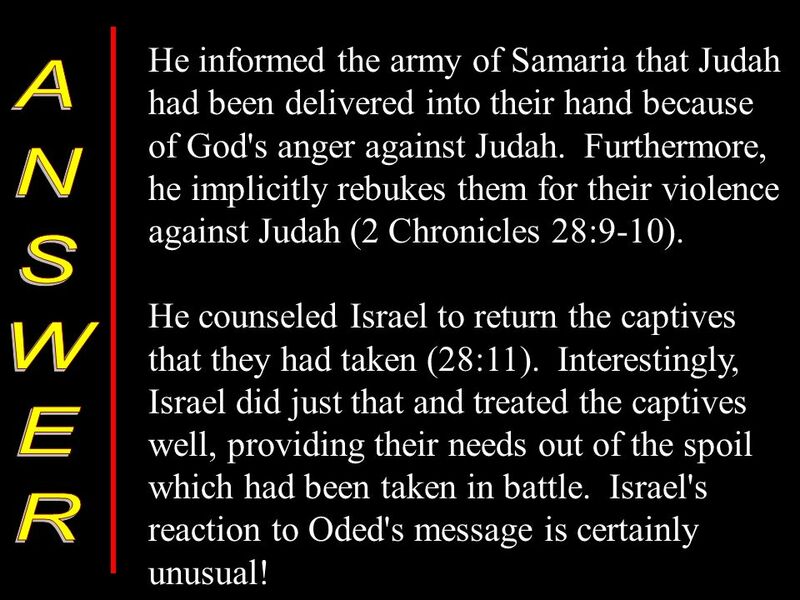 Israel's reaction to Oded's message is certainly unusual! 16 Hoshea had been paying tribute to Shalmaneser, but he withheld his tribute one year and formed a conspiracy against Assyria with Egypt. The Egyptians were, at that time, really unable to help Hoshea and so the king, in 724 B.C., went to meet Shalmaneser V, who was on his way to Israel, with the overdue tribute. 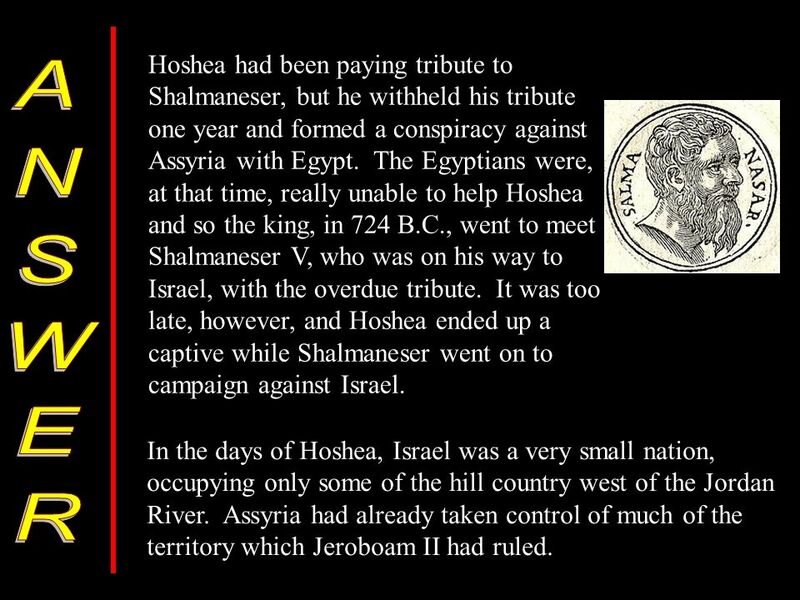 It was too late, however, and Hoshea ended up a captive while Shalmaneser went on to campaign against Israel. In the days of Hoshea, Israel was a very small nation, occupying only some of the hill country west of the Jordan River. Assyria had already taken control of much of the territory which Jeroboam II had ruled. 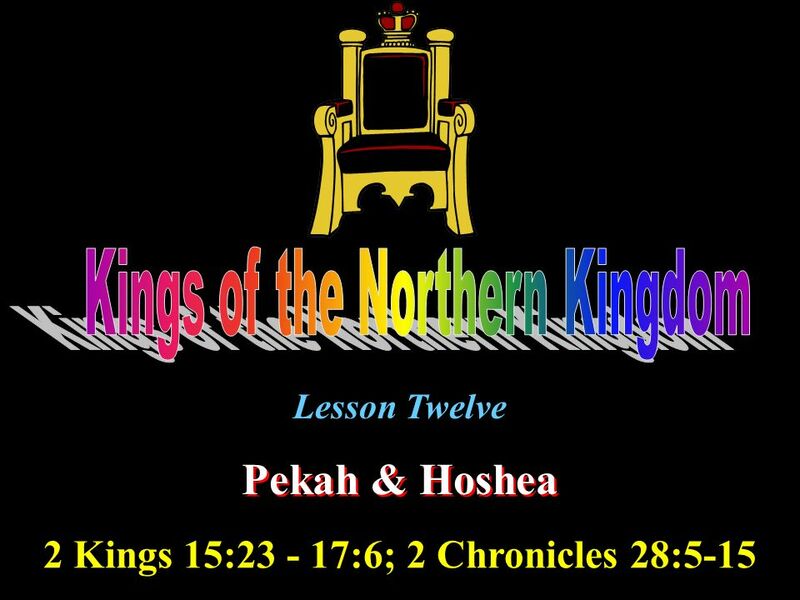 Download ppt "Lesson Twelve Pekah & Hoshea 2 Kings 15:23 - 17:6; 2 Chronicles 28:5-15." Lesson Three Nadab, Baasha, Elah & Zimri 1 Kings 14:20-16:20; 2 Chronicles 16:1-6. Lesson Four The House of Omri 1 Kings 16:21-18:26. Lesson Five Ahab, Elijah & Syria 1 Kings 19:1-20:43. 1 Introduction to 1 & 2 Kings 23 September & 2 Kings Originally one book in the Hebrew O.T. Split into two books in the Greek Septuagint. 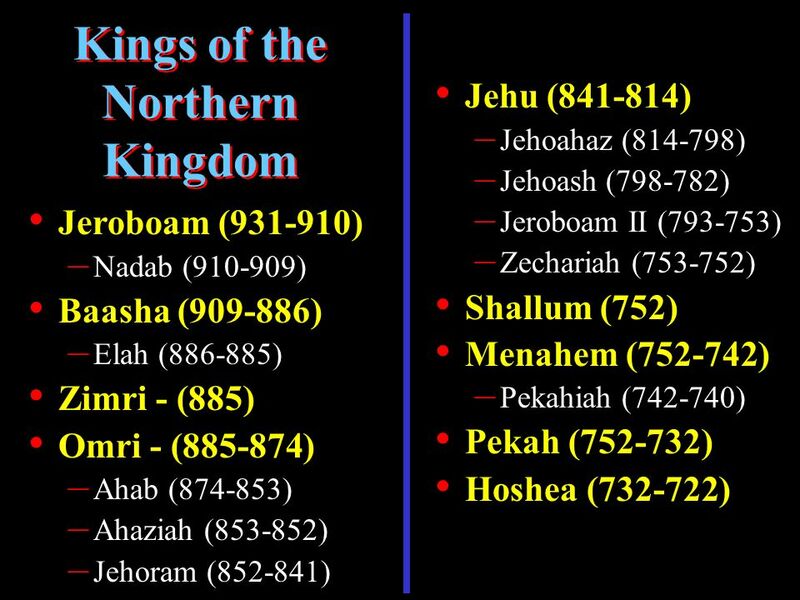 Judah (and Benjamin) Israel (Ten Northern Tribes) Ahaz ( ) 16yrs Bad Shallum (752) 1 mo Bad Hezekiah ( ) 29yrs Good Menahem ( ) 10 yrs. 1 Kings, chapter 16 NIV 1 Kings 16:1 Then the word of the LORD came to Jehu son of Hanani against Baasha: 2 "I lifted you up from the dust and made you. Genesis Exodus Leviticus Numbers Deuteronomy Joshua Judges Ruth Joshua Judges Ruth 19 Kings of Israel 20 Kings of Judah 597 BC597 BC 597 BC597 BC 721. 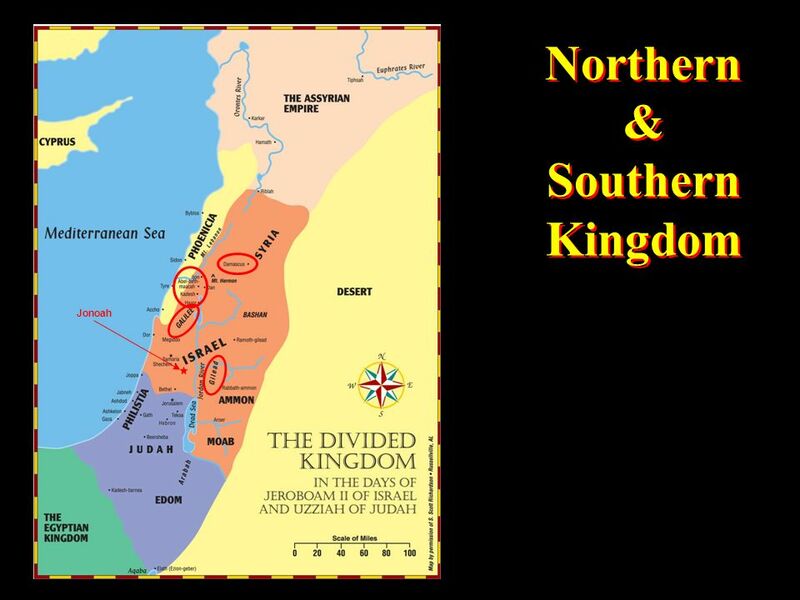 The Divided Kingdom and Israel’s Fall Old Testament Survey: From the Division of the Kingdom to the Fall of Israel. Eighth Century Prophecy Amos, Hosea, Micah, Isaiah. 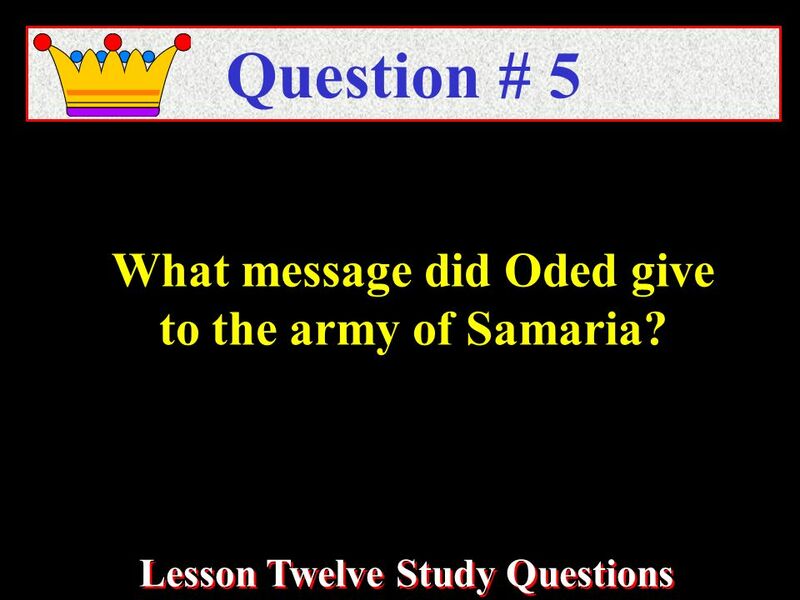 QoD: How did God judge Israel’s kings? Unit 2, Lesson 5. Thru the Bible in 24 Weeks. Introduction The Bible contains stories of the greatest EVILS..... betrayals, revenge, deception, and The ultimate Prince. 14 All right then, the Lord himself will give you the sign. Look! The virgin will conceive a child! She will give birth to a son and will call him Immanuel. Is the Bible a message from a God I can’t see? Archaeology. Opening the Scriptures! Three Year Study thru the Bible Daily Reading - Bookmark available in the back Weekly Study – on Wednesday nights at 6:30 This. The rise and fall of the Kingdom of Israel From David to captivity.